Use painted watercolor paper to make a square or rectangular basket. Instructor will pre-paint the paper with fun colors so participants will have a variety of papers to choose from. 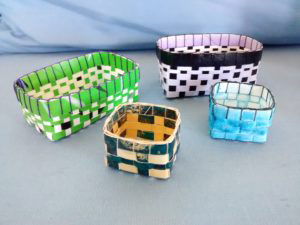 Learn basic basketry techniques to weave the paper strips into a colorful basket. Applying finish makes these baskets very stiff and usable.